We got to chat with actor/musician Odiseas Georgiadis recently about his upcoming Netflix original film – The Perfect Date! Check out our exclusive interview with him below, and be sure to check out the film which releases on Netflix on April 12th! 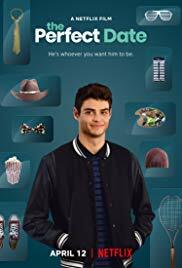 About the film: Brooks Rattigan (Noah Centineo) has the academic chops to get into his dream Ivy League school, but what he’s missing is an outstanding extracurricular — and the money. When he seizes on an opportunity to make some extra cash by posing as the boyfriend of a self-assured, combat boot-loving girl named Celia Lieberman (Laura Marano), he finds he has a knack for being the perfect stand-in. Together with his programmer friend Murph (Odiseas Georgiadis), Brooks launches an app selling himself as a plus-one for all occasions. Along the way, he meets the girl of his dreams (Camila Mendes). But when business starts to boom, Brooks must reassess everything he was once sure of. HNS: When it comes to The Perfect Date and Murph, how did you initially get involved and what drew you to the role? Odiseas: I got involved pretty much very organically. It was just an audition that came through while I was in New York, and I auditioned and dropped a tape for it. It was one of those things where the ones that I do book are the ones that I don’t really think about much. So I just dropped a tape, but I didn’t expect anything from it. The next thing you know, they called me. They gave me a call back and I thought ‘whoa!’ and then it went much further than that, so the next thing you know I’m in New Orleans doing it. It was a cool experience. When we did the test, we actually did it not face-to-face, but only a Skype call between Noah, the Director and I. And after that it was like, I was going to New Orleans for a job. So it was pretty natural and organic. It was pretty cool. HNS: In what ways did you relate to Murph? Odiseas: I related to the fact that he loves what he does so much. In my life, my passion is my purpose and I take it very seriously when it comes to acting or to music or anything I do, I go fully, fully, fully in on it and I feel like he really has that trait as well. He did what he loves. It’s just on a different platform, he just likes the tech stuff but I’m the same. And also the love for his friends. I feel like when I’m friends with someone I’m a very loyal friend. He really cares about his brother Brooks, and I’m the same way too. HNS: What I really love about Murph is that he’s not your typical side-kick best friend, he totally calls Brooks out when he’s not being a great friend and he really stands his ground. Odiseas: For real! Yeah! That was one of the traits that I did like about him, was just the fact that, exactly what you said. He didn’t take it and it was like this realness to it too, you know it wasn’t like fake or anything. I really dug that. Hearing it from somebody else, I kind of re-live that within me. Because I forgot about that aspect of him. But yeah, it’s a cool thing. Because that’s how it really is and I think that’s how it should be actually because real friends keep it honest with each other, not just what each other wants to hear. HNS: I know that you said you guys filmed in New Orleans, did you do any cool things there with the cast to bond? Odiseas: Really, we worked on set so much it was mostly bonding stuff within our grounds, aka the hotel. So like, there were moments where all three of us would chill in Noah’s room till late hours just getting to know each other, and one night we watched episodes of a show and yeah just stuff like that. Sometimes in the week we would go work out together, Noah and I, we would go to the pool on the roof but it was mostly like within that. We didn’t really hit New Orleans itself too much, just one time. It was just me and Noah at that point, I forgot what parade it was, something but not Mardi Gras, but we went when we were shooting, it was like around March. We went there, it was mad fun. It was good to see the costumes and all the cool shots. I’d never been there! It was my first time going to New Orleans. I kind of wanted to experience more. But one day, one day. HNS: Speaking of Noah, he’s become quite popular recently and I know that the majority of your scenes were with him, so what was spending time with him like? Odiseas: Spending time with him was cool man, I definitely consider him a brother. I feel like he just, what he shows people is what he really is. He’s a very cool, down to Earth dude. Actually it’s funny because when we were shooting the film, it was when he was still on The Fosters. So the movie hadn’t come out yet, when we shot [The Perfect Date], To All the Boys hadn’t come out yet. So we shot this before that, way before that, in 2018. So it happened after the fandom, this movie used to be called The Stand-In and everything. So it happened after all that. And when it happened, I hit him up like, ‘Bro! You’re like blowing up right now. It’s crazy!’ I was just very happy for his success. But yeah all in all, he’s just a cool dude. HNS: I feel like the film is super relatable to your senior year of high school. I feel like it really captured all of the feelings that you go through, which are so unique to senior year. What was your senior year like? Odiseas: Not gonna lie, my senior year was actually pretty fire. My senior year of high school was actually pretty fun. It always happens to me, whether it was middle school or high school, it didn’t happen in the same way but I thought I was feeling it out freshman year and sophomore and junior year. And I think it was the same with middle school, 5th, 6th, 7th, it was like ok ok ok, then 8th grade came and it was like OK! So the beginning of high school, it was like me getting fresh out of middle school, and I had stopped around 5th grade trying to fit in, and I was focused on enhancing who I was, focusing on my music, focusing on all the things I was and doing me to the best of my ability. All while treating others with kindness and equally. Everybody was loved, but at the same time, you do have to know yourself in order to give love. So senior year of high school, I felt like everything came together. You were making friends up until that point but senior year, you’re like these are my brothers actually because of all the time we’ve spent together. I had my close, close friends, but was also cool with everybody in school. And then senior year I had my first girlfriend. So it was a good little year. We had our senior trip. But at the same time for me, the only thing is my peers were all going off to college and I had decided because I had been doing music and acting since I was young, since I was like in the 9th grade, about 12 or 13, I decided to just keep doing what I was doing instead of go to college, so I knew I wasn’t going to see them. That was kind of the only bump for senior year for me but I find that the people who are your true brothers and sisters, you guys stay together. But it’s crazy how you see the number of people you hang out with drop. I feel like a lot of people go through that. After high school, it drops drastically. Only maybe three or four people from high school yeah. But those people, of those people those relationships are very, very strong. But that was my high school. HNS: There’s a moment in the film where Brooks kind of gives Brooks and Celia this look, like he already knows even before they do that they have feelings for each other, so I feel like Murph has kind of been the voice of reason. I feel like he’s the wise one of the film. Is that something that you really liked about him? Are you also like this? Odiseas: I feel like I’m ok at that. I can kind of tell when something’s going down. But I feel like Murph really, deep down he wasn’t trying to completely take him away from that, because he saw his friends happy, that’s like ‘good going bro!’ That’s why he said you should go, because he cares about him. But at the same time, he loves chilling with him like a brother too. So he was like ‘let’s go do our thing, you know you can do your thing too, but it was like all of it was kind of going away, so he kind of knew that was the reason… It happened because he cares and I think that’s a cool thing. Yeah I really liked the scene where he told him to go, I really dig that, because it’s not like so needy you know? It’s just like ‘alright bro, do your thing.’ And I see it. I see what’s going on. And I feel like half way, that look, he’s kind of happy for his friend. Because it hasn’t been like that for him for a while, or maybe ever. HNS: You might not know the answer to this, but I’ve gotta ask. We never found out what Murph’s love interest’s name is – ‘Tuna melt guy.” Do you know what his name is? Do they ever discuss it? HNS: And lastly, I know you mentioned music a lot, so what’s next for you in both acting and in music? Odiseas: So right now I’m back in my city, New York is kind of like my wife right now, I’m in love with this city. In this industry, it’s New York and LA. But it’s like when you’re doing acting, it’s go to LA! But I’d like to stay here as long as I can. So I’m out here in New York and it’s inspiring me to create and I’m working on original music now. And I’m in the studio a lot. I just finished shooting, on the acting side, I just finished a show called Trinkets, which is also a Netflix original. And that was my first series regular role on that. That was a great experience. We shot that in Portland. So that’s next. And also a show called “Tails” it’s an anthology series, and I play a very interesting character on that, so that’ll be cool. So that’s about it. Just focusing on my music and acting at the time. So we’ll see. The next thing, only God knows. ‘The Perfect Date’ releases on Netflix tomorrow, April 12th!